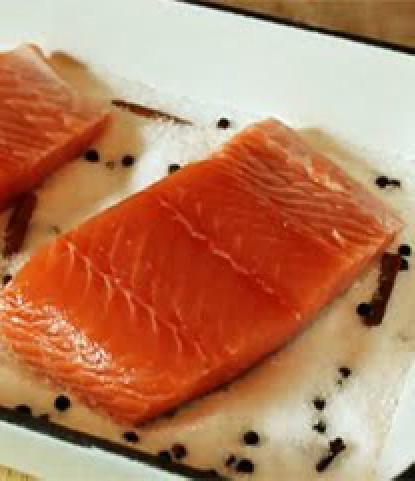 Roasted salmon on aromatized salt -- Lean meal with irresistible flavor. Different from usual, but still tasty and healthy! * These ingredients are enough to make a 4 slices of salmon! For this recipe you need a salmon with the skin. In a mixing bowl add 10 tablespoons salt (big sea salt or plain salt). Then add one tablespoon coarse black pepper and a tablespoon of cinnamon. Mix it well, and pour it in a baking pan evenly as you can. Add the salmon pieces(skin at the bottom) Cover them with a piece of baking paper, and then cover the pan with aluminum foil. Leave to cool slightly and serve it with some vegetables.